30-Day Whole Foods Cookbook and Meal Plan offers an accessible and sustainable program for eliminating processed foods and revitalizing your health.Overly demanding and restrictive whole food diets are challenging to follow in the short term, and even harder to sustain for a lifetime of healthy eating. The 30-Day Whole Foods Cookbook and Meal Plan offers an accessible and attainable program to eliminate processed foods in one month and revitalize your long-term health.Designed as a sustainable whole foods diet, this 30-day plan consists of forgoing processed ingredients, excess sugar, and large (if not all) animal food portions. With recipes like Falafel Bowls and “Cheesy” Broccoli and Rice, this whole foods cookbook emphasizes consistent, balanced meals that leave you fulfilled—not deprived—meal to meal, and day to day.30-Day Whole Foods Cookbook and Meal Plan includes:An essential introduction that explains the benefits of a whole foods diet, along with which foods to enjoy and avoid.Weekly meal plans that include shopping lists and make-ahead guidance for the full week.65+ recipes that include breakfast, lunch, dinner, snacks, and even dessert!Eating well to live well shouldn’t be a struggle. 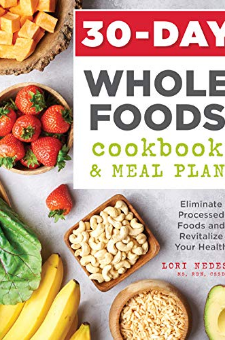 The 30-Day Whole Foods Cookbook and Meal Plan offers a less-restrictive and more pleasurable way to eliminate processed foods from your diet and reset your life.